After levelling off in the second half of the last decade, CMOS image sensors are in the midst of a strong new wave of growth, which is being driven by a broad range of applications and promises to lift worldwide sales to record-high levels each year through 2019, according to the 2015 edition of IC Insights’ O-S-D Report—A Market Analysis and Forecast for Optoelectronics, Sensors/Actuators, and Discretes. The O-S-D Report’s forecast shows CMOS image sensor sales climbing 15% in 2015 to reach an all-time high of $10.1bn after a strong 19% increase in 2014 and subpar 4% growth in 2013 that primarily resulted from steep price erosion and inventory corrections in camera phones. 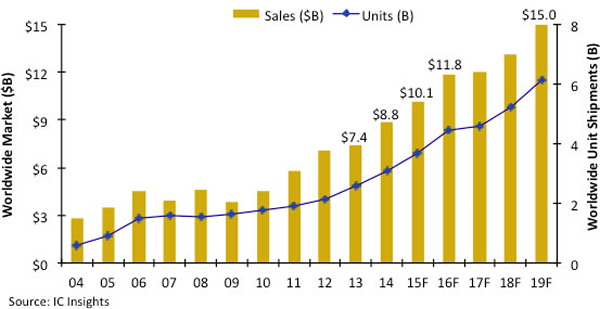 CMOS image sensor unit shipments are now projected to grow 19% in 2015 to a record-high 3.7bn after rising 20% in 2014 and 2013 (figure 1). For about 15 years, digital cameras in cellphone handsets have been the dominant system application in CMOS image sensors and that will continue to be the case in the second half of this decade, but growth rates in this optoelectronics semiconductor category are expected to be pushed higher by new automotive and machine-vision applications, security and surveillance systems (including body cameras), medical imaging, and a wide assortment of optical-sensing nodes tied to the IoT. In 2014, about 70% of CMOS image sensor sales ($6.2bn) were for embedded cameras in cellphones, but that percentage is expected to fall to 49% in 2019 ($7.3bn), which represents a CAGR of just 3.4%, based on the forecast presented in the 2015 O-S-D Report. In comparison, total CMOS image sensor sales are projected to grow by a CAGR of 11.1% in the five-year forecast period to reach $15.0bn in 2019. The 2015 O-S-D Report forecasts sales of CMOS image sensor sales for automotive safety systems will climb by a CAGR of 57.4% to $2.1bn in 2019 and represent 14% of the market’s total dollar volume that year compared to just 3% in 2014. CMOS image sensor sales for security systems and surveillance applications are expected to grow by a CAGR of 38.4% in the five-year forecast period to $899m in 2019, which will represent 6% of the market’s total sales that year versus 2% in 2014. The O-S-D Report shows medical and scientific instrument applications driving up CMOS image sensors sales by a CAGR of 36.0% to $824m in 2019 or about 6% of the total market compared to about 2% in 2014. Toys and video game applications are expected to increase sales of CMOS image sensors by a CAGR of 32.7% to $255m by 2019, which will represent 2% of the market’s total revenue compared to 1% in 2014. Major suppliers of CMOS image sensors are responding to the shift in what’s driving sales growth. For instance, CMOS image sensor leader Sony now aims to become the largest supplier of imaging solutions for automotive systems by the middle of the next decade after it accomplished its goal of taking the top spot in camera phones in the past few years. Sony’s CMOS image sensor sales grew 31% in 2014 to about $2.8 billion, which represented a 32% share of the market’s total revenues, based on the supplier ranking in the 2015 O-S-D Report. After Sony, U.S.-based OmniVision was second in CMOS image sensor sales ($1.4bn in 2014) followed by Samsung ($1.2bn), Sharp ($720m), SK Hynix ($488m), and China’s GalaxyCore ($360m), according to IC Insights’ supplier ranking.